A parade rolls down Main Street around 11 am; all are welcome to enter a float. You never know what you’ll see in the parade, anything from antique cars, tractors, local and state law enforcement, fire trucks, dump trucks to some very entertaining float designs. Parade registration is held the morning of the parade at the Murphy Dam Ball Park. Vendors, crafters and food concessions are available at the Town Park throughout the day for you shopping and enjoyment. There are several contests to enter as well, including photography, baking and flower arrangements. 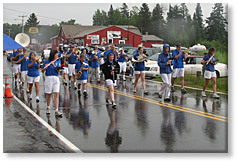 For the music lovers, there is usually a band or two that come to perform during the day as well. Early afternoon take a walk or ride down to the Kids pond for the kids fishing derby. This is one event the young and young at heart really enjoy.